An installation for used cassette players which looks on their obsolescence not as an ending, but as an opportunity to reconsider their functional potential. Superseded as playback devices, they become instruments in their own right. Replacing the prerecorded content of each tape with a microphone gives us the chance to listen instead to the rhythmic and resonant properties of these once ubiquitous plastic shells. Binatone Galaxy brings the framework within which a generation purchased their favourite records to the centre of attention, revealing the acoustics of the cassette and the voices of the machines themselves. 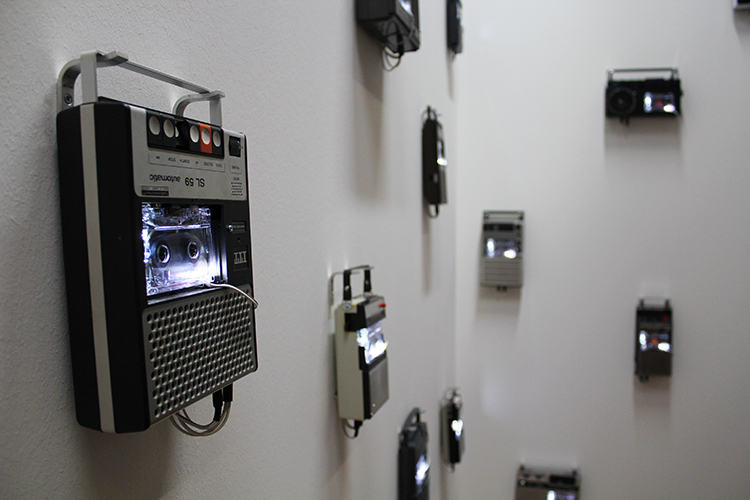 "On the walls of a white room, brightly illuminated with natural light, Stephen Cornford, and artist who describes his work as existing "at the intersection of sculpture and music", has mounted some 30 old cassette recorders. Models from Boots, Sanyo, Robotic, one lone and gorgeously named Binatone Galaxy: they all hang on the walls, wired up, tapes loaded and ready for action. Smitten by an attack of technological melancholia, the visitor can wonder who owned these things, what pop charts did these machines once record? Were they ever placed next to pillows, late at night for surreptitious listening pleasures? What happened to the voices that once rubbed the magnetic heads of these little machines? For some artists, the speed (and resulting impact) of obsolescence on the technology we once took for granted has spawned a form of fetishism, in which the voices - the human agency - they once recorded exist in an alternate, ghostly dimension, a reminder of what once was. This is not Cornford's theme. The fact that each audio cassette in his machines is fitted with a motion sensor and a contact mic, so that, on entry the machines whirr into action, indicates that Binatone Galaxy is very much of the here and now. Yes, Cornford has chosen old, cheap and accessible technology with which to realise this, but I suspect that he is aiming for a furrruuuzzy audio intimacy. The sensitivity of the mics is such that Cornford achieves this well. Each audio cassette becomes not simply a means of playback, but its own indeterminate instrument. It works as long as there is movement to activate it - and like Alvin Lucier's I Am Sitting In A Room, a soundwork which places sonic decay at its heart, each little soundworld within Binatone Galaxy ripples out to form continually newer and fainter ones. It doesn't take long for the noises generated by the playback operations to suggest their own fantasised sounds: the clopping of horses' hooves on the cobblestones outside is one (Campbell Works is situated in a former Stoke Newington brewery); a pulsating brassy sound is another. The effects are surprisingly rich in timbre and intensity. The visitor becomes an unwitting conductor, as sensors will switch off unless continually activated, so tempi and volume change constantly. Combined, there is a continual kinetic activity and rhythm to the piece. There is a practice of deliberate, anarchic displacement, an effort to place things where they shouldn't be, that is central to Cornford's work. It's in Trespassing the Olympic Site, a series of actions in which he tried (with varying success) to penetrate Fortress Olympics in East London, as much as in Battery Acid, scored for car battery, wires and mic cables. The results are not only playful, but a necessary retaliation to all forms of authority, audio or otherwise."